Chief Scientist Erik Cordes is happy. The work on the seepage sites along the Costa Rican margin has taken less dive time than expected, and additionally, the team has been finding multiple new species. The weather has been exceptional. 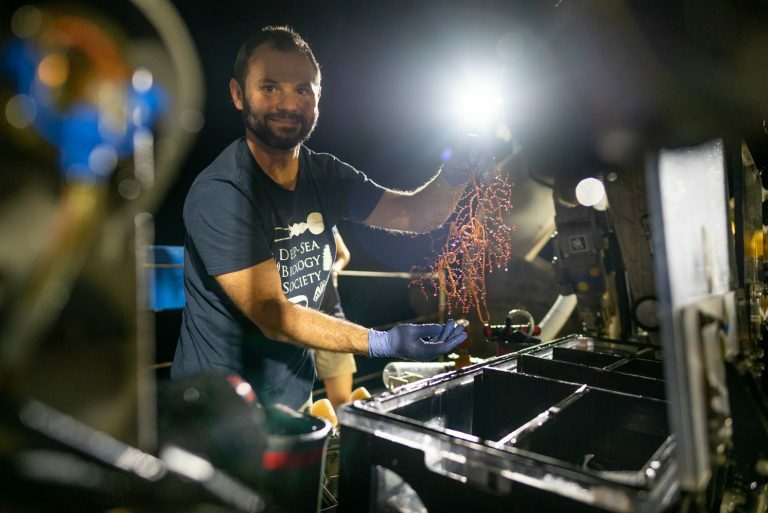 Yet experience has taught Dr. Cordes not to take anything for granted – to get through the high priority tasks first, which is why the Costa Rican Deep Sea Connections expedition has moved forward, beginning the exploration of uncharted seamounts. It is time to sail towards Cocos Island National Park. For Dr. Cordes, this cruise is the icing on the cake of an ongoing investigation. Two previous cruises he managed have already surveyed the seepage sites along the Costa Rica margin, now the team only needs to go back to pick up a few current meters and deployments previously laid down on the seafloor. But before that happens, the team will send Remotely Operated Vehicle SeBastian out to climb two of the seamounts that connect Cocos Island to continental Costa Rica. Seamounts under the ocean, like mountains above the water, create special conditions that foster specific kinds of life. Corals and sponges, for instance, are two species that the scientists expect to encounter. 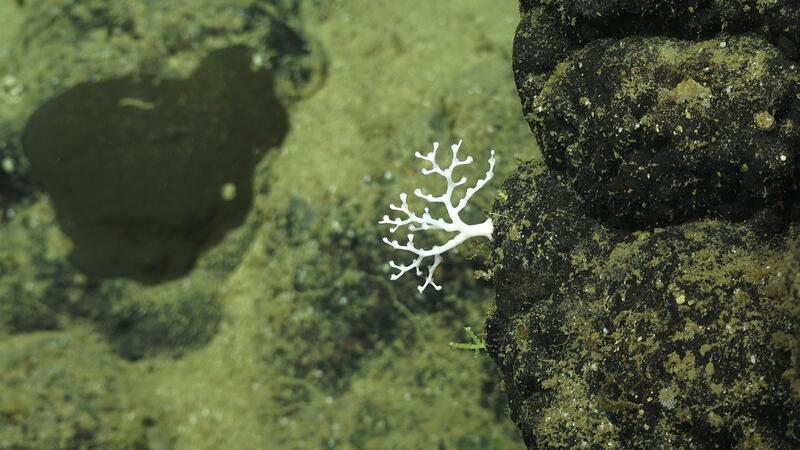 Corals prefer steep slopes because a seamount changes the dynamics of the currents, and instead of having to survive on a flat surface in the middle of the mud, the corals will be sticking up where the waters are flowing and bringing food. 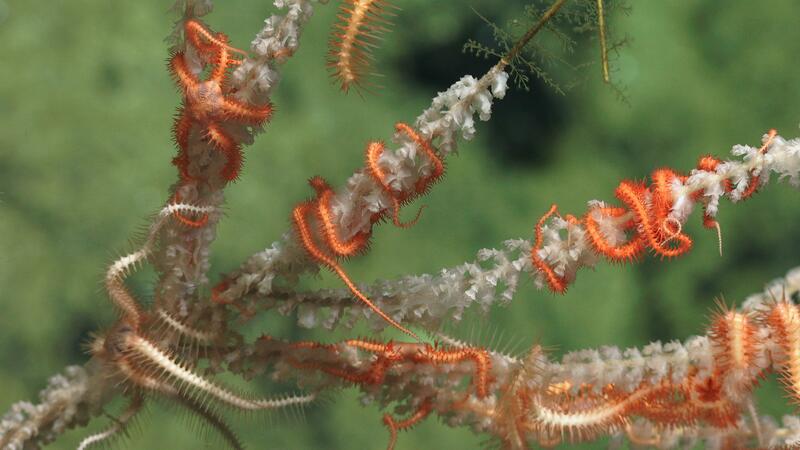 Additionally, their polyps will not get clogged. Sponges are very efficient filter feeders that do not depend on currents bringing them food, but instead create their own current by sucking the water in. They take advantage of the high productivity around seamounts. There is a tradeoff, because even if corals rely on currents to bring them nutrients, when the current is too strong it can break them. Just like on a mountain, whenever you ascend a side that faces really strong winds, the trees will be short. That happens to corals, which in strong current areas will be short and stubby. Just like deciding on a trail to follow before setting up a hiking adventure, the researchers follow certain clues to decide which path to take on their dives. Safety is one important consideration, so they know they can not dive in any area where the current is directly facing the seamount – this is in case both the ship and the ROV were to lose power and be pushed by currents against the submarine structure. Like humans, corals, sponges, and other organisms like to “stand” on the top of mountains and benefit from being exposed to the elements. It keeps them clean and brings them food. There will also be resuspension, so even if nutrients hit the ground, they will be stirred back up by the currents. Birds glide on updrafts – the air that mountains push up. A similar process can happen underwater. 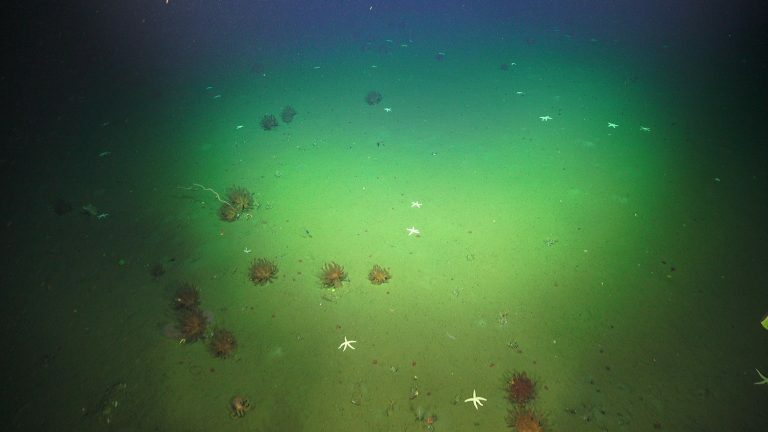 All the deep waters that hit the seamount get pushed up and bring nutrients up to the surface – inducing upwelling and plankton blooms – over the top of the seamounts, which increases the productivity in the surface waters and creates more food to fall down over the deep-sea communities. After climbing mountains underwater, the team is excited about the prospect of walking on the tallest of the bunch, a seamount with a tip peeking above the surface: the legendary Cocos Island. For Dr. Cordes, taking the time to bring the crew and scientists to meet the Park Rangers and look around is a sound investment. “Especially on this ship, everybody comes from different places all over the world. They have friends and family and through them, we’ll be reaching communities that we would never have a chance to talk to directly, and that’s really important,” reflects the Chief Scientist. Possible conservation of some of the seamounts is an important component of this expedition. Education must accompany any conservation effort and creating awareness is fundamental.